Hagoromo congratulates Team 7 and the first Kage. Kakashi is commended for leading the team. Kakashi bids farewell to Obito as he returns to the “Pure World” He takes the Sharingan with him as he goes. Madara, dies as he and Hashirama talk about their dreams. Madara states that “his died out” while Hashirama’s lives on and dies. 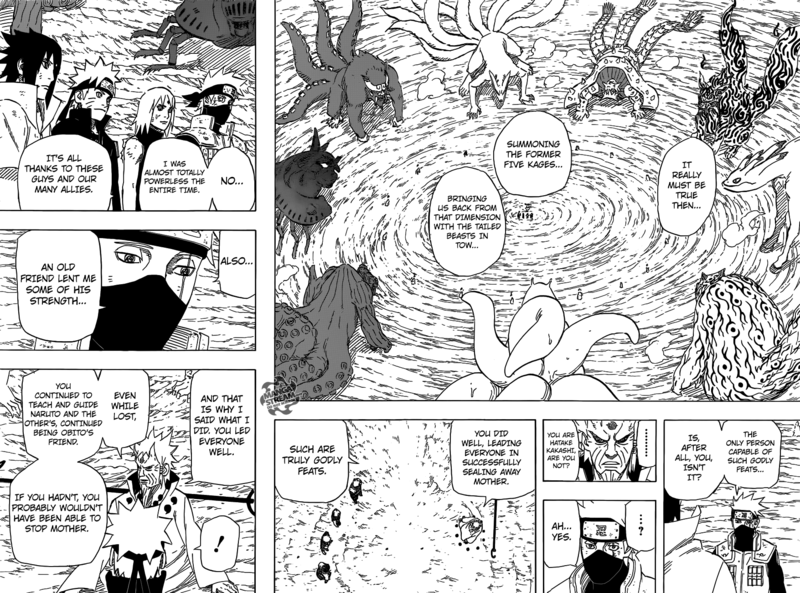 Hagoromo releases all of the Kage, as they return to the “Pure Land”, Naruto talks to his father on last time. 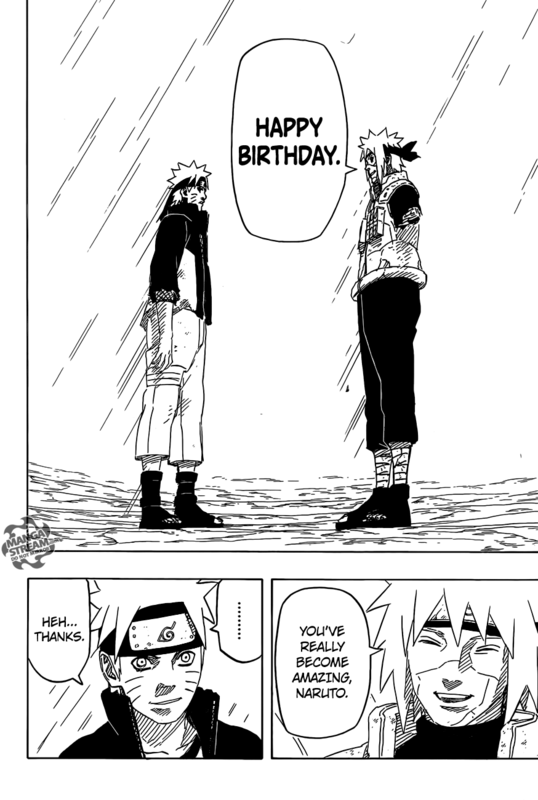 Minato wishes Naruto a happy 17th birthday, he asks his father to deliver a message to his mother and Minato disappears. This episode was a little sad mostly because it reminds me of the fact that Naruto is ending. I’ve been a fan for more than a decades at this point and that is a long time to spend doing anything. I’ve thoroughly enjoyed this series. I did feel for Naruto because while he still has friends his parents will remain deceased.While its not over yet I don’t anticipated any more action in this series. I’m curious to see how they determine who becomes Hokage, and whether they will show us what the future will be like. As Sugar falls unconsciousness once again her “toys” begin to return to their original states. There were eight people per toy, meanwhile Luffy notices Bellamy laying down at the feet of Doflamingo. Luffy demands that Doflamingo let’s him go, but he state’s that the “victor” will decided that. Doflamingo taunts Bellamy and he enrages Luffy as a result. He launches a kick at Doflamingo who uses Bellamy as a shield. Luffy apologizes, Law tells him to calm down and focus on the fight. He tells Luffy to keep his cool. 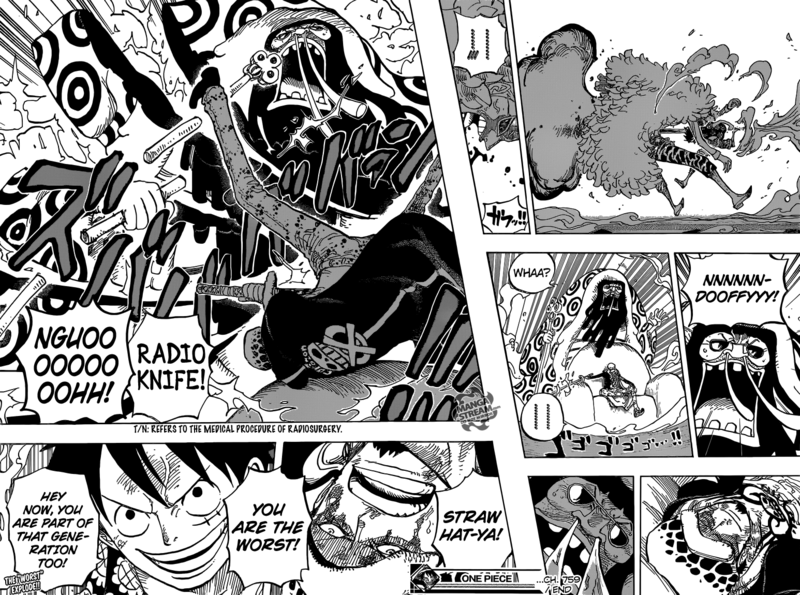 After Doflamingo and Law have an verbal exchange he attacks with “Black Knight”. Luffy attacks Doflamingo but he uses Bellamy controlled by Doflamingo’s devil fruit ability. Luffy refuses to fight against Bellamy as he considers him “his friend”. Luffy becomes angered again due to Doflamingo’s refusal to fight himself and attacks Law with his “Red Hawk” technique. However, Law uses his “Room: Shambles” technique to switch places with Doflamingo. 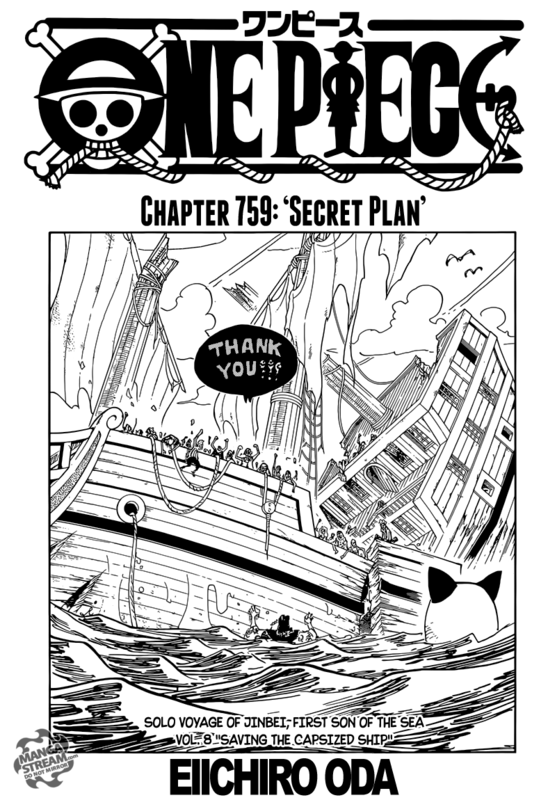 Luffy finally lands a hit on the elusive Doflamingo. The beginning to this fight is all ready interesting. Doflamingo’s cowardice is clear by is inability to fight face to face with Luffy. I don’t know what Luffy and Laws plan are but if they’re going to use their powers together like this the fight will be amazing. However, Trevor’s presence might make it harder to accomplish than they realize. As Hisagi attacks Byakuya, Pepe talks poetic about how “love” is at the center of all conflict. Byakuya is having none of it, and isn’t impressed by his speech. He concludes that Pepe’s ability is simply to control people. He immobilizes Hisagi so that “he’s not a problem”. He sets his sights on defeating Pepe, he uses his ability on Byakuya who dodges. 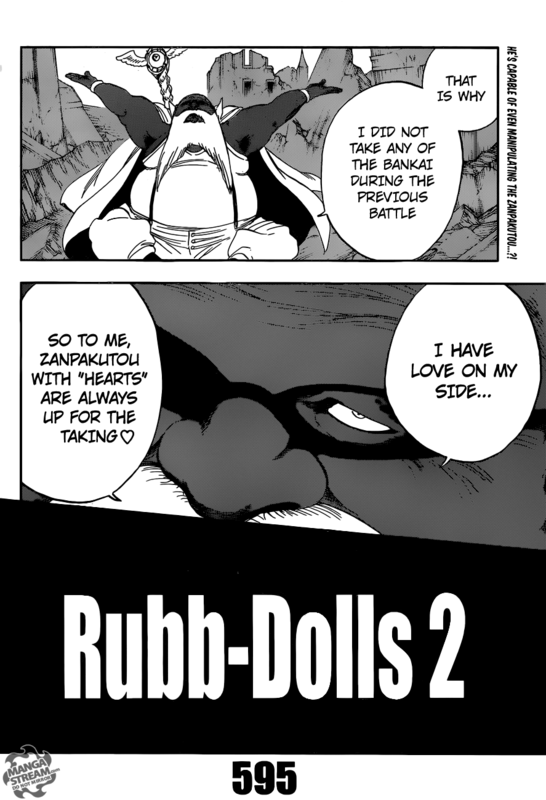 Byakuya concludes that Pepe “cannot manipulate those who are heartless”. 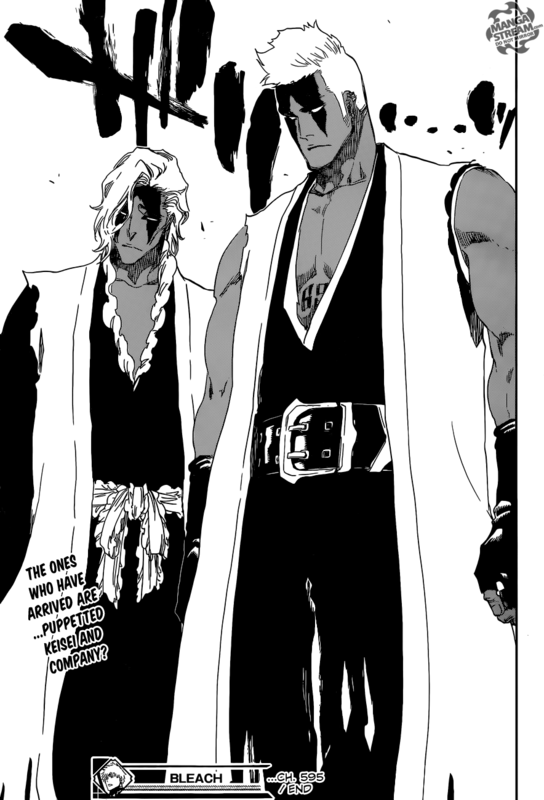 Pepe asks him “why he would block it with his Zanpakuto”. Pepe gains control of Byakuya’s sword who quickly tosses it aside. Hisagi picks up his Byakuya’s Zanpakuto and uses it against Byakuya. Byakuya is hit with Pepe’s “Love Kiss”, but still is able to defend himself. Pepe uses Vollstandig transforming into a mildly inappropriate cupid form, he uses his love rope. Pepe decides that he wants Byakuya to “die by his love”. He then regurgitates a bow in arrow, but before he can use his “ultimate technique” Rose and Kensei interfere. The ending of the chapter was the most surprising aspect of this chapter obviously. Are Kensei and Rose dead? Are they just puppets/zombies that are still “technically” still alive? Are they helping or just getting in Pepe’s way? All these questions will most likely be answered in the next few chapters. The fact that Pepe’s “love” can control Zanpakuto’s. I’m probably not going to be the only to say this but, Pepe’s “cupid” look I’ll just say there’s too much in that diaper.